Introducing Lancome’s 5 star shades with bold colours, matte finish, comfort and high-precision to define your smile with millimetric precision. Available at $44 each, this intensely saturated matte lippie is surprisingly moisturising and long lasting. With its iconic bevelled tip is reinterpreted, it makes application so much easier and accurate than expected! 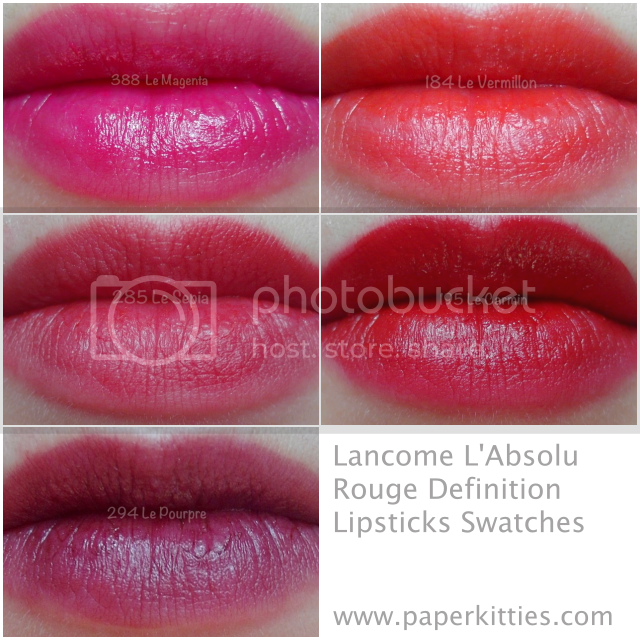 Here are the lip swatches for Lancome L’Absolu Rouge Definition Lipsticks 5 star shades! I like how Lancome L’Absolu Rouge can be easily manipulated into a lip-stain ombre effect. Simply apply it in the middle of your lips, then use your fingertips to pat it out. The saturation is therefore reduced and look more sheer in the process, bringing out a very natural glow from within that is ideal for daily wear. After work, simply apply another layer all over to bring back the rich intensity and you’re good to go! For favorites, I’m torn between the classic 195 Le Carmin and the very wearable 388 Le magenta. Unfortunately, I was least keen with 294 Le Pourpre as the colour wasn’t as intense as I was expecting it to be, the final look reminded me more of a tinted lip balm than a matte lipstick :/ Perhaps it was also because of the fact that I am not very used to such dark colours too. Overall, I love L’Absolu Rouge Definition Lipsticks for their longevity and the creamy matte texture that goes on smoothly when applied. I didn’t notice any fading, bleeding or feathering throughout the day, even when I am snacking non-stop, and how they don’t dry out my lips at all!